Accounting allows you to create an invoice for a specific customer that needs to be repeated for a specified period or time. This process is called recurring invoices, whereby you create an invoice that needs to repeat every day or every month or every year on a specific date or time for a specific customer. This process will repeat until the end date has been reached. When the recurring invoice is created, specifying that it must recur every month, for example, Accounting will generate a new invoice on the given date, and if an email address is available send the new invoice to the recipient. 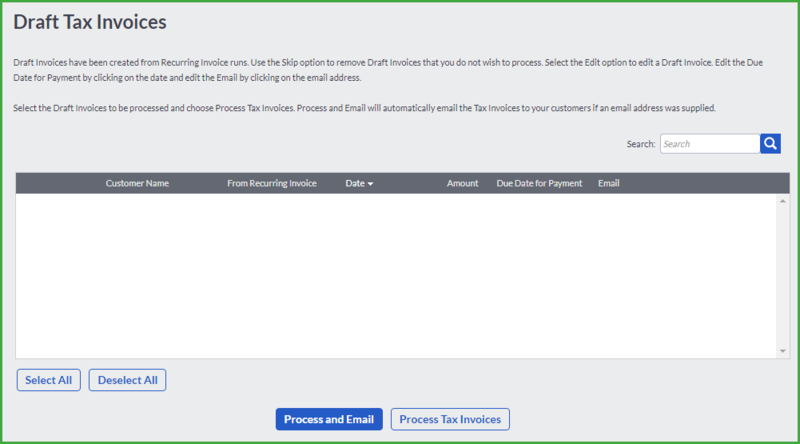 Alternatively, the recurring invoice process can create draft invoices for you to process as tax invoices in your own time, optionally sending them directly to the respective customers by email. Note: When a recurring invoice is created, it will be flagged as active. Should your registration expire or you fail to pay the subscription fee, the system will reset the recurring invoice to create new invoices as draft invoices. If you do not re-register or pay within a month, all recurring invoices will be flagged as inactive and the system will not create any more draft invoices. When you do re-register or pay, you will need to edit each of your recurring invoices and manually mark them as Active, by selecting the Active check box, as well as select the Automatic option on those invoices that must be emailed automatically. Access the Recurring Invoices from Customers…Transactions…Customer Recurring Invoices. 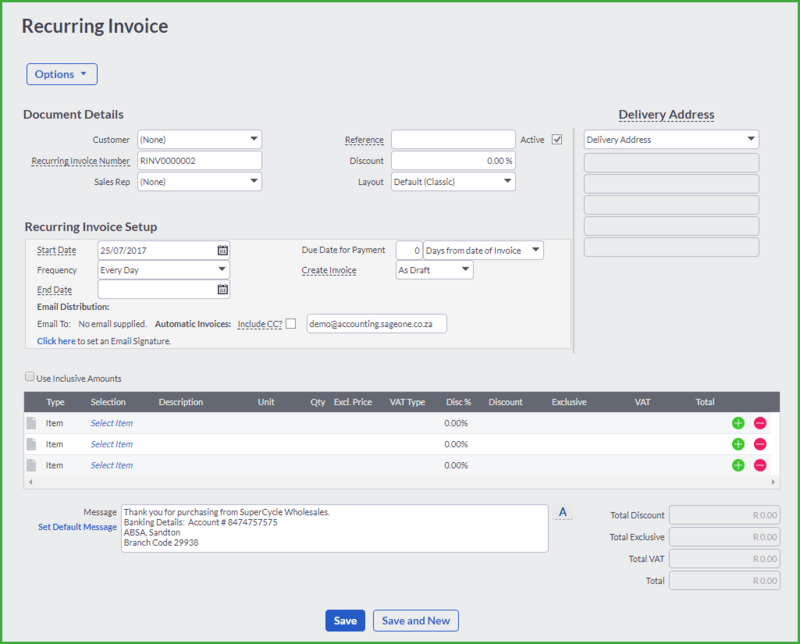 To add a Recurring Invoice, click on the Add Recurring Invoice button. Select the Recurring Invoice recipient from the customer drop down list. The system will generate the next Recurring Invoice Number. If you choose, you can edit this number. If there are multiple users set up on your company, the Recurring Invoice Number field will display NUMBER. The next consecutive number will be allocated by the system when the Recurring Invoice is saved. Enter a transaction number, name or description in the Reference field for future reference purposes. If a discount applies to the customer transaction, enter a discount percentage in the Discount % field. Ensure that the Active check box is checked. If it is not, the system will not create any new Invoices from this Recurring Invoice. Start Date of the Recurring Invoice. Frequency of the Recurring Invoice, be it daily, weekly, monthly, annually, and so on. End Date, which will indicate when the system must stop creating Invoices from this Recurring Invoice. Due Date for Payment, which the system uses to calculate the Payment Due Date on each Invoice created from this Recurring Invoice. Email address, if the Invoices are to be sent automatically. Click Email Signature to enter text that will be included in the body of the sent email. Check the CC check box if you want to send a copy of the invoice to yourself or another recipient. Accounting automatically populates your registered company email address in this field. Select whether you want the system to save the Recurring Invoice as a draft or to process and send the new Invoice to the customer automatically. You then enter or select one of the multiple delivery addresses. Check the Use Inclusive Amounts check box to enter inclusive prices, and uncheck the check box to enter exclusive prices in the Lines section. Enter the invoice information in the lines by selecting the Items or Accounts that need to be invoiced. Add a message in the Message box, if applicable. Click on Save or Save and New to update the system with this information and/or create a new Recurring Invoice. Recurring Invoices are specific to a particular Customer. You cannot invoice multiple customers based on one Recurring Invoice. 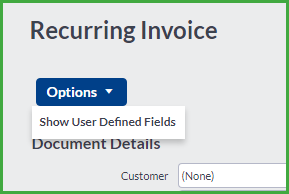 You can add additional User Defined fields to your recurring invoice. To do so, click on the options button at the top of the screen followed by the Show User Defined Fields option. If you want to view your Draft Invoices, click on the View Draft Invoices button. You can now select the Draft Invoices that you want to process. You can select all by clicking on the Select All button or deselect all by clicking on the Deselect All button. The system selects all of the invoices by default. You can edit a Draft Invoice by clicking on the edit link next to the Draft Invoice line. The changes that you make to the Draft Invoice will only apply to this invoice occurrence and will not update the original Recurring Invoice. The next time the system processes the Recurring Invoice, the Draft Invoice will be generated as per the original setup information. You can also delete the Draft Invoice by clicking on the delete link next to the Draft Invoice line. If you delete the Draft Invoice at this stage, it will only delete this invoice occurrence and not delete the original Recurring Invoice. The next time the system processes the Recurring Invoice, the Draft Invoice will be generated as per the original setup information. Process and Email, which will process the selected Draft Invoices as Tax Invoices and email them to the relevant Customers. Process Tax Invoices, which will process the selected Draft Invoices as the Tax Invoices, but will not send them. You will then be able to print the Tax Invoice and send it to the customer.